Two years ago, TaxAct made massive improvements to their online tax preparation software. But it sort of seems like they’ve been in a holding pattern since, without a lot of new features. This year, there’s just one big one: in January, stock investors will be able to directly import transactions from brokerages, a major upgrade over previous versions if you’re in that situation. Meanwhile, they’ve raised their rates, including creating a new “basic” paid tier for people with the very common situation of having dependents, without appreciably changing what they offer—although now that many companies have removed phone support for lower-paid tiers, TaxAct’s maintenance of that feature for the still-pretty-cheap “basic” tier is now noteworthy. It’s still a great choice for people who have used the software in the past, but most people looking to file for the first time will find better value elsewhere. Here’s why in our TaxAct Review. One of TaxAct’s strength’s is their easy to use Navigation Menu. Like most tax preparation software, TaxAct has a guided option where the software asks a series of questions, and prompts you to enter information in the necessary places. The TaxAct questions tend to be a bit more complex than top of the line software packages like TurboTax or Credit Karma Taxes, but TaxAct makes up for the complexity by offering an easy to use menu. You can see this at work in this screenshot: I’ve checked off the types of income I have so TaxAct can ask more questions, while the left-hand menu shows where I am in the overall sequence. In my opinion, TaxAct makes it easy to hop in and out of the software, so you can fill out your tax return as you have time. TaxAct’s navigation is superior to most tax prep software packages, including some of the more expensive options. It’s also, in my opinion, an attractive interface; it’s actually a pleasure to look at the screen! TaxAct also has a mobile app that you can use to, among other things, snap a picture of your W2 for uploading. You can switch back and forth from the app to your computer seamlessly as they update in real time. Unfortunately, TaxAct’s easy navigation and basic import abilities (like pulling your W2 directly from your employer) doesn’t overcome some of its downfalls. Simply put, for people with more complex tax situations, TaxAct isn’t as easy to use as H&R Block or TurboTax. I struggled to figure out how to deduct part of my house (we rent out our basement), for example. 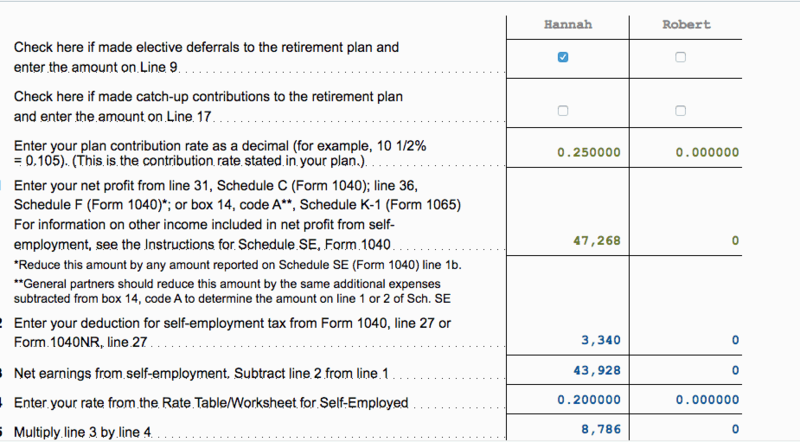 When it came to figuring out how much I could contribute to my individual 401(k), I had a hard time using the form, and ultimately used an online calculator instead. In the past, we haven’t recommended TaxAct for people who earn a lot of dividend income, or who buy and sell stocks frequently. In January, the Premier+ tier’s Stock Assistant will allow you to directly import transactions from your brokerage by entering your login credentials (which firms exactly are supported will be released in January.) You can also now import a CSV file. These features will make it much easier to use TaxAct if you have a lot of these types of transactions. In general, the software is pretty easy to use. For basic filers who don’t have to itemize their tax returns, I think it’s a great solution. It’s also easy to use for people with basic itemizations, basic rental properties, and side hustles (with straightforward expenses). Also, having used TaxAct in the past, I was impressed by how much information TaxAct saved for me. This made it easy to see how my taxes changed from year to year. Many tax software options offer that service, and for good reason. Having a year to year comparison of taxes can really help you understand what changed, and how that affects your tax refund. TaxAct doesn’t have in depth knowledge articles to help their users learn more about the tax system. However, it’s worth noting that the knowledge articles that TaxAct offers are easily accessible through the Help Navigation Menu on the righthand side of the screen. TaxAct stands out as one of the best “curators” of knowledge articles. They have some nice assemblages too, like this page for self-employed people. TaxAct does make some info available through “popups” if you click on the “I” symbol (see screenshot). I did wish that was present in a few more places but overall they’ve done well to embed info on confusing terms throughout the software. In most cases, the knowledge articles were sufficient for answering questions. Personally, I wish they had more “human friendly” explanations on some finer points (especially related to deductions and credits), but the knowledge articles were adequate on most points. Their Tax Reform page is helpful on the basics and includes a nice calculator letting you estimate your 2018 taxes under the new law, but is light on detail. Whereas several online tax software companies have now restricted phone support to higher-paying customers, TaxAct still makes phone support available to its lowest-paid tier. From mid-January to April’s filing deadline, you can reach them M-F 8 am to 8 pm Central, Sat from 9 am to 5 pm Central, and Sun from 10 am to 5 pm Central. The rest of the year phone support is available M-F 8 am to 5 pm Central. Email support is also available to all. Free customers can get some very limited technical assistance by phone – limited to help signing in and making account changes. For actual tax questions free customers are restricted to email. Most plans with TaxAct comes with unlimited phone based tax and technical support, although free customers now can’t get much on the phone beyond help with their TaxAct accounts. If you’re filing early, you should have no problem reaching customer support to get the individualized attention you need. The two highest-paid tiers also now include in-software video chat and priority access to email/phone queues. TaxAct charges separately for State and Federal Taxes, but basic W-2 job holders who don’t need to claim deductions or credits will get the software completely free. Unfortunately, if you need to claim any deduction or credit (including the Earned income Tax Credit or Dependent Care Tax Credit), you’ll have to upgrade, at least to Basic+ and possibly to Deluxe+. This is where H&R Block’s Free option really shines as it’s truly free. This year TurboTax is also including a free option that includes most of the dependent and earned income credits. So unless your situation is really simple – you’re young and carefree, with no dependents and a single W2 job – you’re probably better served to look elsewhere. Who Should Use TaxAct Online 2018-2019? I continue to like TaxAct for people who only have a W-2 job, and who don’t need to claim deductions or credits. Its interface is nice to work with, and additionally, more complex filers who used TaxAct in the past will appreciate the ability to compare their return this year to their return last year. TaxAct is also appropriate for people who will pay extra for professional tax advice – including phone support. TaxAct only offers their “Audit Defense” to the top tier filers. This could be a good value if you have questions that you need answered. The bottom line is that there are better options for free filers, investors, and self-employed individuals. The only ones who really benefit from TaxAct this year are repeat customers and those who want phone support at a relatively low price.